Mother Nature has a way of ruining even the most carefully thought out plans, especially when it comes to beach excursions. A little sun and some seaside breeze is always welcome, but too much can turn your otherwise fun day at the beach into a disaster. Don't let the elements ruin your beach vacay... popup canopies for beach use to the rescue! Last update on 2019-04-26 at 03:51 Product prices and availability are accurate as of the date/time indicated and are subject to change. Any price and availability information displayed on [relevant Amazon Site(s), as applicable] at the time of purchase will apply to the purchase of this product. Nobody wants to see their possessions overturned because of an exceptionally strong sea breeze, nor would they want to get sunburned because they didn't have any outdoor coverage. Thankfully, a simple sun shade pop-up beach tent is all you need to make any weather more tolerable for your excursion. However, with so many brands and models out there, how do you know which pop-up canopy is the best? While there is no single best canopy for beach use, the trick is knowing what your needs are and looking for the right canopy that matches those needs. Is price your utmost priority? Do you need a bigger canopy that can accommodate a large group of people? Will you use the canopy a lot, hence requiring more durability? The Kingpin took a gander at some of the most popular pop up beach sun shade bestsellers on Amazon and compiled a list complete with brief details on each canopy's good points, bad points and what other users are saying about them. 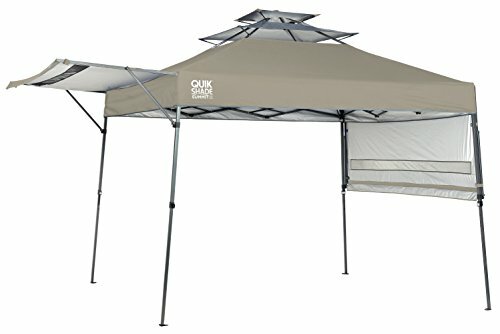 Description: If you want the best canopy tent for beach outings, the Quik Shade Solo Aluminum Compact Instant Canopy is your best bet. 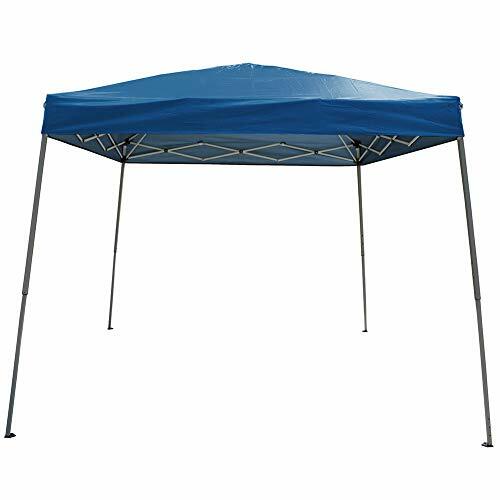 Large enough to accommodate 6 people, this canopy is extremely lightweight, so you won't break a sweat while lugging it around. It's so lightweight, it only takes one person to carry it around and set it up. It's also easy to store – once folded up, it fits perfectly into a small package, which can fit easily into your cabinet. However, its lightweight nature is both a pro and con. Although the canopy is easy to carry and assemble, it is also less stable compared to other heavier canopies. The canopy doesn't do well against heavy winds, unless you attach it firmly to the ground using stakes. Unfortunately, the stakes that come with the canopy are on the shallow side though, so you may need to buy a thicker and larger stake. The product is also lighter because of its thinner, aluminum legs. Some users say that the legs of this canopy are a bit delicate, so make sure you assemble and take it down carefully to avoid breaking the legs. 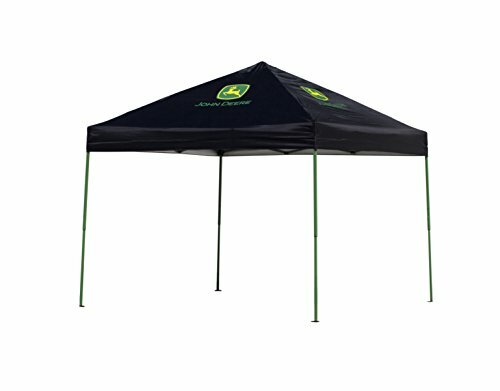 Description: The John Deere Marketplace Instant Canopy is a commercial grade pop-up canopy that has seen a lot of use in outdoor fairs and makeshift merchant stalls. However, you can also use it as a pop up canopy for beach meetings, especially one that involves a lot of people. It's a bit on the heavy side, but that's understandable as it's more durable and larger compared to other pop-up canopies. It may not be compact and easy to carry around, but it's meant to be big and burly, as it leans more towards commercial use. While most canopies are perfect for a small family or a group of friends, this one can accommodate an entire group of people. It's perfect for team building activities or grand corporate meetings. It's durable and steady as well, so expect it to stand strong against strong gusts of wind. As with all John Deere products, the canopy has the John Deere logo on the cover, which make it look more professional and classy. This would make the canopy a good choice for business-related outings. To give it more durability and stability, the canopy uses overlapping eaves as well as a system of sliders and push buttons that you can adjust. While this ensures better security and stability, it also makes canopy assembly more tedious. Because of this system, someone unfamiliar with canopies might experience a bit of difficulty putting the canopy up or taking it down. Description: The Quik Shade Summit X SX170 Instant Canopy with Adjustable Dual Half Awning﻿﻿s is probably one of the best pop up canopy for beach use, especially for those harrowing, hot summer days. The two half-awnings on opposite sides of the canopy offer extra protection from the sun and give your canopy an extra touch of privacy. The canopy's design prioritises better airflow, which helps a lot during extremely warm days. The dual awnings also give the tent more versatility. You can pull it down to give the tent occupants additional protection from the rain and sun. On the other hand, if what you need is additional shade space, you can put the awnings up, to act as natural extensions to the original tent. The top of the canopy tents out a bit, forming a peaked roof, so the canopy is more vulnerable to suddent gusts of wind. The tent peak serves as an air pocket, making it easier for the wind to knock it over. Make sure to stake it down to the ground properly. The canopy comes with an extensive system of anchors and stakes to help give it leverage. Keep in mind though, that the awnings mean extra assembly time and users of this canopy report that they usually run into problems connecting the canopy parts because of its complexity. Description: According to the manufacturer, the ShelterLogic Slant Leg Pop Up Canopy was designed for outdoor use, specifically for sporting events, concerts and the like. However, it also makes for a great pop up shade for beach use. The canopy is incredibly lightweight so it's easy to tow around and setting it up is a breeze as well. What's most notable about this canopy is its versatility – the price range varies according to the design, and the price tag on the basic designs is downright cheap. It's rare to see a single canopy model with such a wide price range, but it makes the product viable for everyone, from penny pinchers to splurgers. As with all lightweight canopies, the ShelterLogic Slant Leg Pop Up Canopy suffers the same weakness – low tolerance to extreme weather. A particularly strong gust of wind can knock this baby down, so you might want to bring additional anchors for good measure. Aside from that though, this canopy is a really solid purchase. The price is reasonable and the canopy itself is user-friendly in terms of assembly and mobility. 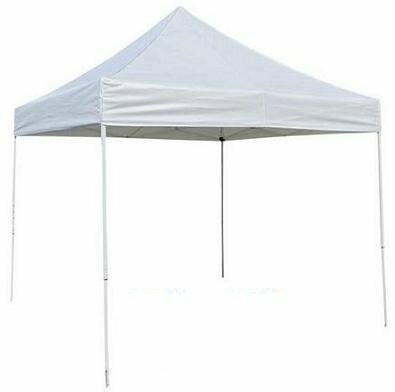 Description: The Polar Aurora 10' X 10' 5 Color Slant Leg Easy Pop up Popup Canopy Party Sun Shade Tent thrives on its versatility – it's strong and durable enough to serve as a beach sun shade pop up, yet mobile ang lightweight enough to use as an outdoor market stall as well. The canopy comes with a silver undercoating that lowers the surrounding temperature and protects its occupants from the sun's harmful UV rays. The design is minimalist, with legs that effortlessly snaps into place, making for quick assembly and take down. 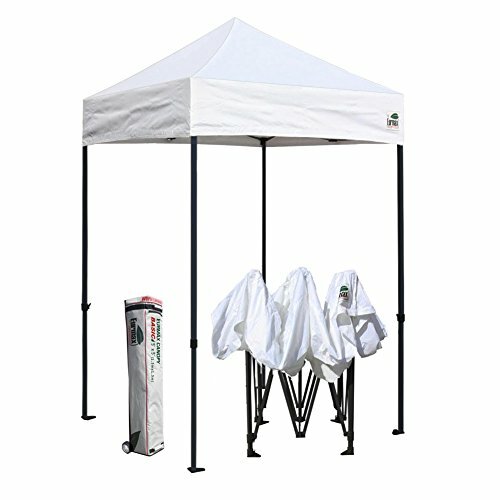 The canopy cover has a cathedral-style ceiling, giving it an extra bit of height.The canopy comes with its own carrying case and is available in a variety of colors. If you search the Internet for reviews, you may see the occassional report about leaks or broken frame legs, although it might have more to do with packaging and delivery errors than the actual product itself having durability problems. Also, the tent is designed for temporary use, meaning it shouldn't be left out in the open when not in use. Description: Not every excursion to the beach has to be a grand one. Sometimes, you just want to spend a nice day out on the beach with your significant other or immediate family. 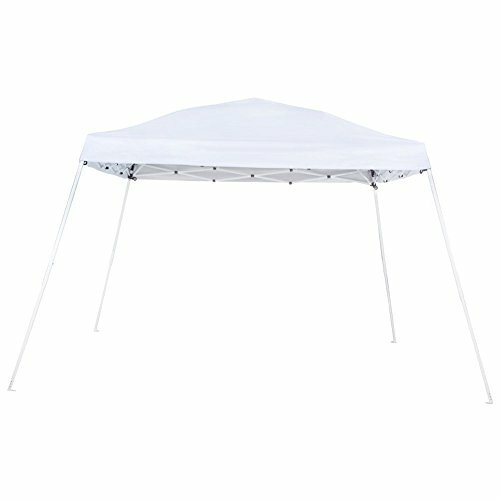 If this sounds like you, then you might be interested in the Eurmax 5x5 Easy Pop up Tent Outdoor Patio Instant Canopy. The dimensions are small enough to fit up to a small family of 4 or 5. Because assembling and taking down this canopy is easy, it can serve as a permanent fixture in your backyard or patio, which you could take down and carry with you each time you have an outdoor excursion. The canopy holds up very well to varying weather conditions like heavy rain, sunlight and strong winds. Although the canopy comes in five colors, the design is very basic, which some people might find boring and plain. According to the manufacturer, the canopy is also meant for large events like weddings and trade shows. While the canopy itself is small, you can also purchase several and have them lined up to form a larger shaded area. 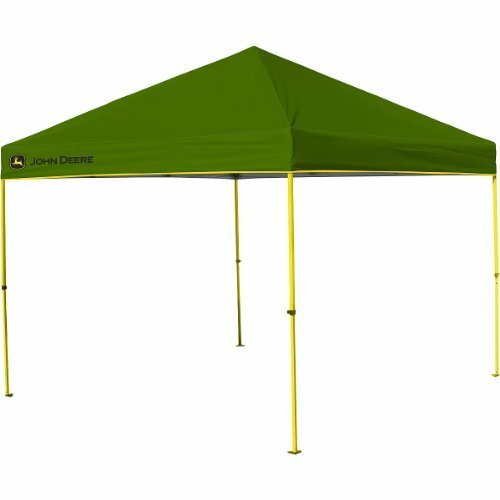 Description: The John Deere Instant Canopy lives up to its name – with its simple design, you can assemble or take down the canopy instantly, making it a perfect companion to an impromptu beach getaway. The canopy offers 99% protection from UV rays, and its steel frame is corrosion resistent, giving it more durability. Its carrying case comes with wheels, which makes for easier transport. Now, this might be the best canopy tent for the beach, but the product is geared towards hot summer weather. It does extremely well to disperse heat and give adequate shade; however, there have been complaints regarding its use in rainy weather. Although the canopy can be used during camping trips or in patios, some customers say that the canopy's material is not 100% waterproof. It's still a great option for beach excursions; just make sure not to subject the canopy to too much precipitation. 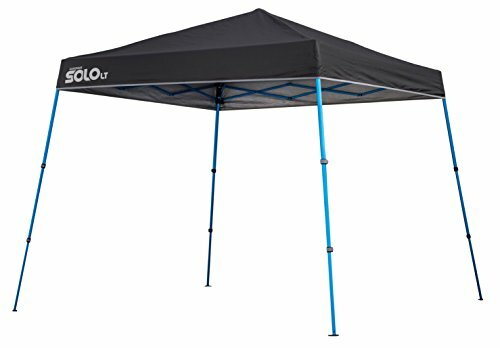 Description: With a carrying weight of 19 pounds, the Quik Shade Solo LT 90 Aluminum Compact Instant Canopy stands as one of the most lightweight canopies in the market. This is astounding, considering it can accommodate an average of 8 people. This canopy is even lighter than canopies half its size and capacity. This maybe due to its ultra light aluminum frame. Not only does it weigh considerably less, it's also easier to carry around, assemble and take down. Even a single person without any experience with canopies can assemble this one. The legs are already preassembled, you just need to release the Cam-lock lever to extend the legs when you need it. The canopy is perfect for beach and park outings, or any outdoor activity for that matter. Although the canopy is durable, it is lightweight, meaning it might not hold its ground against strong winds. Staking down your canopy would be the best option to add stability, except that the canopy prefers weights over stakes. You can always buy your own stakes and use it to stabilize the canopy; however, it would have been nice if it came along with the entire package in the first place. Description: While some users say that the is not the best canopy for the beach, it is definitely one of the cheaper ones. The price tag on this canopy is very economical, considering its large size. It has a base dimension of 10 FT. x 10 FT, with a capacity of around 6-8 persons. The frames are made of steel, giving it extra durability and stability. Included is a wheeled carrying case for added mobility. This may not be the most luxurious canopy of the bunch – in fact, the design is extremely simple and plain – but its low price make it a viable options for people on a tight budget. If this is your first time buying a canopy, the Quest canopy is a great place to start. It's also a great option for people who love to go on extreme outdoor adventures. Even if the canopy breaks or tears, buying a new one won't break the bank. It is also a good option for large events like flea markets, as you can easily buy several of these because of its affordability. The only con is its plain design, but that's forgivable considering its price. Surprisingly, the canopy even holds its own when it comes to battling the elements, although we don't have a lot of information regarding its performance against heavy winds. Description: With a name like Beach Cabana Sun Shelter Beach Tent : The Aloha, you know you're definitely getting a canopy that's designed specifically to be a beach sun shade pop up canopy. When it comes to looks, this canopy does not disappoint. The beach tent boasts of fun and vibrant designs that make it unique from other boring, single-colored canopies out there. The design is very user-friendly: it consists of four sand pegs and two pole holders, which make for easy assembling while making the canopy more secure. The structure encourages natural airflow, so aside from giving your family shade, it also ensures that the inside of the beach tent doesn't get too stuffy and hot. The canopy material is both UV resistant and waterproof, making it viable in all weather conditions. While other canopies usually have holes near the legs where the stakes go through, this beach tent uses connected ropes and sand pegs to fasten it to the ground. The canopy kit even comes with its own mallet so you can pound the sand pegs in. While this may seem less dependable than the traditional built-in stake hole, the beach tent performs adequately in moderate winds; just be careful when it comes to strong winds and make sure to fasten the sand pegs well. Description: The Abba Patio Slant Leg Instant Pop Up Folding Canopy with Roller Bag has a dimension of 12 x 12 ft., making it one of the largest canopies on the list. You may find it surprising that despite its large size, it is also one of the cheapest canopies as well. 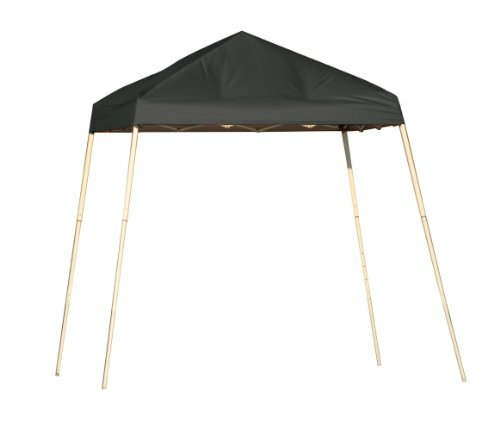 Don't let the tempting price tag fool you; this canopy actually delivers, even more than some of its more expensive counterparts. The canopy is lightweight and versatile. From its full height of 8.7 ft, you can take it all down in just a few steps, and this giant of a canopy compacts pretty well, fitting into a small roller bag and can tuck into your storage compartment easily. Setting it up is just as easy even without any tools thanks to its extendable legs and durable upper cover. While the canopy makes for a perfect pop up sun shade for beach activities, it can also be used for sporting events, weddings and commercial celebrations. The cover material is treated with fire and water resistent properties, although the canopy itself isn't meant for long-term use. Now, you may think all of this is too good to be true because of its low price, but the quality is pretty good for a temporary canopy, emphasis on the word “temporary”. The canopy isn't meant to sit out in the open for too long – you're supposed to set it up for the occasion, and then take it down again once the event is done. Description: As its name would suggest, the ProSource Easy Pop Up Tent Instant Canopy prides itself for its user-friendly installation and quick assembly time. It only take a person to set up, as the top pops out easily, and the legs attach to the top cover easily via velcro straps and hooks. 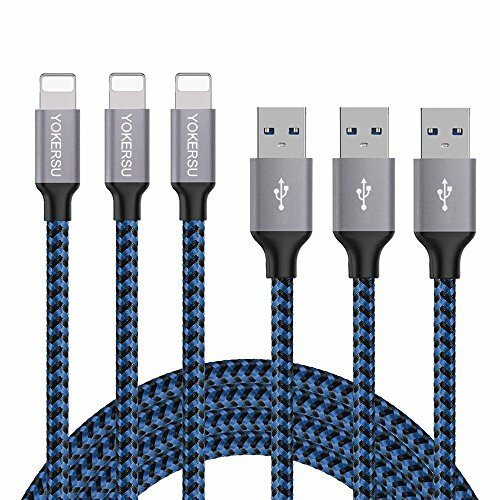 Although the top cover is made of fabric, it is durable and resistant to tearing. This canopy also has thicker legs compared to other canopies on the list, making it more sturdy. One thing that users first notice and love about this canopy is its extra head room. The canopy is taller than most, with the tent's highest peak reaching 11'5". This should come as a relief for people who are fed up with having to duck in and out of the canopy. The extra height also helps promote better airflow and makes the canopy more spacious than it actually is. There's just one problem with this canopy, and it's a problem that affects most, canopies on the list. More often than not, when you get a canopy that comes with its very own stakes, the stakes turn out to be too shallow and too tiny to be of practical use. As a general suggestion, it's better to buy your own stakes, no matter which canopy you choose. 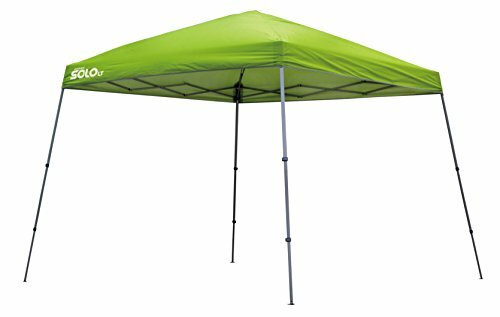 With that, we wrap up our list of best canopies and pop up sun tents for beach use, according to the users of Amazon.com. Now there's absolutely no reason for you to go on your next big beach outing without a canopy or beach tent in tow. There are a lot of great options when it comes ot pop up canopies, and we're well aware that we may have missed some. Hopefully, reading this article has helped shove you in the right direction in terms of purchasing the best canopy for your nice day out on the sandy shores.